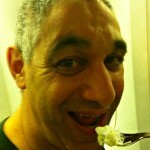 Day 155 in Beijing: The Non-Honeymoon Sweet! So, Jill and I went on vacation to Malaysia and Singapore. It was our first trip outside of China together. It was my 5 month anniversary of being in China. It was Jill’s 3 month anniversary of being in China. I was our 5 month anniversary. What it wasn’t was our honeymoon. However, don’t tell that to the best customer service employee ever, Emily. She found out that we were going on vacation and decided to call a friend and set up an amazing surprise for Jill and me. 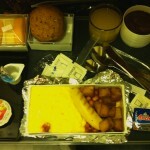 We had set up our flight to depart Beijing at 12:05 am on Saturday morning and arrive in Singapore at 6:05 am the same day. We knew it was going to be a red-eye and neither of us sleep that well on planes. We were a bit apprehensive as we were leaving China, for the first time, and wondering if there might be visa issues. Here’s the deal: Jill is on a one year tourist visa to China. This is actually wonderful as they are quite hard to get at this point. One of the rules is that she must leave the country ever 90 days. This is a pretty cool “rule” in that it means we have to travel outside of China and see other parts of the world. It can be expensive but we look at it as a glass half full kind of thing. Actually we see it as glass totally full because we get to live in China and then “have to” travel the world. Not too shabby for a guy from Healdsburg and a gal from Nebraska. As we sat in our seats and looked out at the black Beijing sky, a flight attendant came up to us and said, “Hi! 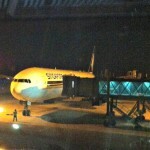 Welcome to Singapore Airlines. We are so glad you have chosen to fly our airline on your honeymoon.” We were dumbfounded and confused but said, “Thanks!” and then realized that Emily had called them and told them that we were on our honeymoon. This would have been hilarious and enjoyable enough but that was just the beginning. As everyone fell asleep, I got up to walk around. I decided that since Jill was sleeping and we didn’t want to bother people, we would have it after breakfast. He smiled and walked away. After breakfast, which was delicious, the flight attendant brought over two glasses full of champagne, a beautiful cake and two teddy bears as gifts! We were totally surprised and overjoyed with how generous Singapore Airlines had been and what Emily had done for us so that our trip would start out so magically. 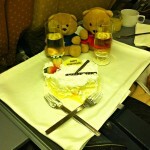 The cake was yummy as can be and the bears became our buddies when we traveled around Malaysia. The champagne was Tattinger and was excellent. We may not have stayed in the honeymoon suite, but this non-honeymoon was sweet! 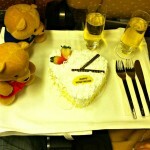 The honeymoon cake, teddy bears and champagne! The bears were ready to drink champagne!